Ok. Well i find a lot of posts never put if they solve it. Well i got it as gd as i think i can. I tried upping the main as post people seem to suggest. Well all that did was make er back fire and bog worse. I figured i might as well try a lower one since the plugged looked like it was running rich. I dropped too a 137. 5 and i had no bog. I ran it down the road and back a few times and thats the best the bike worked since we have owned it. Could i get it better if i tried even more jets. Well maybe. But its so much better now that im happy with that. Im still confused about this procedure as well. How will it have vacuum if I take the intake side off. Now that I think about it, it probably needs vacuum, which means it should be running. I’m too used to working on FCR carbs. Anyway, it sounds like you found it. I just buy new jets every season to keep them clean. Worth the $12 to not have the headache. OK. So we finally went out for a rip today. The bike worked great for 40 min. Then BAMMM bogggggg, boogggg. Almost to the point that she would barely run. Ride like that few a few min and decide to head home. But again if I just play with the throttle the whole time then it gets better and almost works again. Got home pulled the plug right away. BLACK. Dry but black. So I wipe the plug off best I could without having a new plug, put it back in and now runs great again. So am I still too rich, should I drop the main jet size again. Down to factory. I went from 150 which is what came in it when I bought it and it running like crap down too a 137.5 which made it run way way better but the plug still fouled. So now what, drop jet size again, or try to get more air in, maybe remove the air filter but leave the cover? Anyway on the chance that this may help someone else we went for a run last weekend. Bike again worked great. All day... then BOGGGGG. This time we took notice that it worked great all day until we hit some puddles. Just after the puddles BOGGGG. We struggled home and I got the air hose out and started looking around. Well the guy before me put an after market CDI on the bike and it must be a little bigger than stock. The Rear fender was rubbing on the CDI and wore a hole thru the protective rubber coating and started into the CDI metal. I cleaned that off, blew it off with compressed air and dried it, Started the bike up and it run perfect again. I hope that fixes it, I put silicone over the exposed part on the CDI, and am also going to put a bag over it and may relocate it. I Did cut a small section off the fender where it was rubbing so I may not have to re locate it. I also ordered a Dyno jet kit to get my jetting right. Nice.....with your mods you'll probably be running a 155 or 160 size Dynojet main. Life is tough...........it's tougher if you're stupid. What is this. And do i need it. I think this may have been my problem. The wires going into it were broken and just hanging on. Last edited by Duffieboy; 11-27-2017 at 07:29 AM. 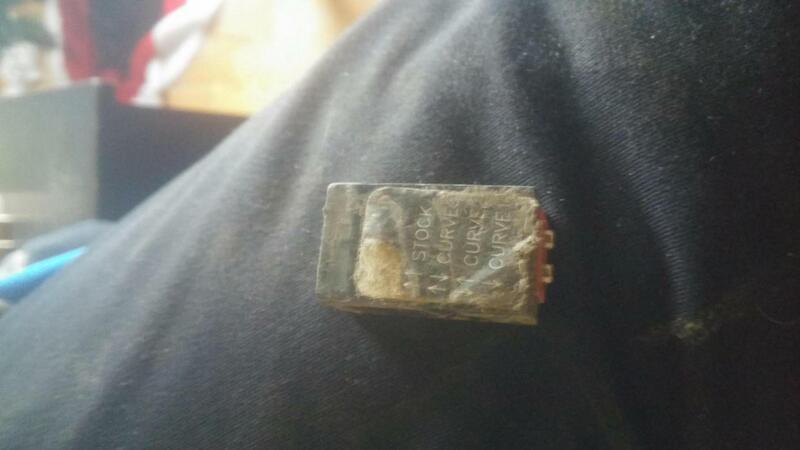 Never seen one of those, but it appears to be some type of ignition advance controller? Yeah, remove that. Just need to run it in the wet sometime or spray it down and try it now. That is a curve switch for a programmable Dyna CDI. There are 4 curves that can be set with that switch. So was it ok to just remove the switch?? It seems to be working fine now. Should I just get a new CDI? With the switch removed it will default to the stock curve. Leave it alone.